St. Dennis Band are delighted to confirm two new appointments to the organisation, that of President and Chairperson. At the recent AGM it was confirmed that Judith Mitchell has accepted the position of President. “I am the eldest daughter of Denis Hill who, until his death recently, has been the President of St Dennis Band for many years. My father and mother bought Trewan Hall in St Columb in 1961 and set up the campsite in 1965 in order to keep the estate going. I was 5 years old then and enjoyed a childhood there with my siblings until my marriage in 1979. In 1992, after bringing up 2 girls, I joined the family business. I have lived on site since then helping to manage the campsite and work on the estate. St Dennis Band have been a huge part of our successful entertainment for our visitors during the summer, including the Band fetes. We are thrilled that Judith has “picked up the reigns” from her dad and we look forward to a long and happy association. Judith has kindly agreed to present the Band’s annual awards at the forthcoming “Patrons and Friends” concert on Friday 5th April, 7:30pm at the Bandroom and we look forward to greeting her and her family at her first “official” event. Also at the AGM our longstanding Chairperson, Rodney Richards, announced his retirement from the post having filled it since 2012. Rodney has been associated with the Band for many, many, years first having contact with the Band over 70 years ago and having been a player at the time of the late, great, Eddie Williams. He started playing on a severely battered pre-war cornet and was sent to a 90 year old gentleman for lessons! He has had various roles within the committee over the years and his tenure as chairman has seen the Band progress into the top class Championship outfit that it is today. “Over the years I have been honoured and proud to be in this position and this year has shown how much the Band has improved in all ways. It is now a group of talented musicians who have so much respect for each other and they are a team, a band family. We sincerely thank Rodney for his enthusiastic leadership and have lost no time in appointing him as Vice-President! The new Chairperson is Philip Willcock who was enthusiastically and unanimously voted into the post at the AGM’s election of officers. Philip is a former playing member of the Band, starting his playing career in the late sixties under the expert leadership of long term resident St Dennis conductor, Eddie Williams. Philip remembers the halcyon period for him and fellow teenagers playing in both St. Dennis Bands culminating in National Final appearances with the Senior Band at The Royal Albert Hall and the two successive National title wins with the Youth Band in the 1970’s. Philip returned to the fold in recent years playing on the back row cornet bench. Now retired from management positions in the distribution and retail industries, Philip is keen to assist in the continued development of the Band, so expertly led through many recent successes during the tenure of outgoing Chairman, Mr Rodney Richards, and the Professional MD, Mr Darren Hawken. We are very much looking forward to working with Phil, and like Judith, his first official event will be the Patron’s and Friend’s Concert. As part of the recent restructuring of their Junior and Youth organisation, the St Dennis Band are pleased to announce Mark Arnold as their new Youth Band Tutor; to work alongside Linda Trethewey in the Band’s Music Academy. Vastly experienced, Mark played percussion for most of Yorkshire’s Championship Section Bands including Carlton Main, Brighouse & Rastrick, Black Dyke Mills, and for 14 years Grimethorpe Colliery. He also was a member of Grimley Colliery Band in the hit film Brassed Off. Since turning his hand to conducting, Mark has built a reputation of developing young talent and has enjoyed success after rebuilding St Austell Youth Band and latterly Indian Queens Band. Mark is no stranger to the St Dennis, assisting on Percussion wherever possible and supporting his wife Emma, who is the Band’s Principal Cornet. Mark commented, “This is a great opportunity to rebuild St Dennis Youth Band into the formidable entertainment band it was renowned for and deserves to be, bringing fun into brass banding and teaching the brass players of the future. Mark will be working closely with Linda Trethewey who is already progressing well with the Junior Ensemble. Youth Ensemble rehearsals currently take place every Thursday 6.30 to 7.30 pm. If anyone aged 19 or under wishes to express their interest in joining the ensemble, please contact Mark via our website contact form. St Dennis Band were passed a band photograph recently via The China Clay History Group with a request to potentially name the Band conductor and players and to estimate the period that the picture was taken at the front of St Dennis Rectory. 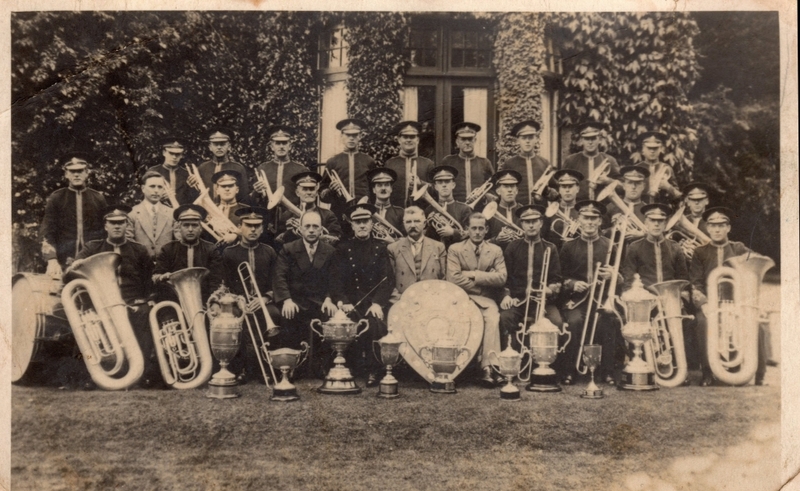 Senior members of the St Dennis Band organisation agreed that the picture was almost certainly pre-war and with research from the fine array of competition trophies displayed in the photograph, in time could ascertain an accurate date. Imagine Phil Willcocks surprise to obtain confirmation that the photo was indeed taken in 1929 and the privilege to meet, and talk banding of yesteryear with a St Dennis Bandsman proudly stood as a member of the cornet section in the actual picture. The meeting was on the occasion of Mr Frank Brewer’s 103rd birthday celebration at Amberley House, Truro with Frank displaying an enlarged framed identical picture on his living room wall. Aged 14 yrs at that time, Frank followed his father, Frank Brewer Snr (bass trombone) in the band moving to solo euphonium until the 1950’s, then continuing his end chair seat position touring all over the world with The Central Band of The RAF. His one regret during this time was not playing under the baton of Eddie Williams who he agrees was a massive asset to St Dennis. Frank has always retained a strong interest in the progress of the band from this time on. 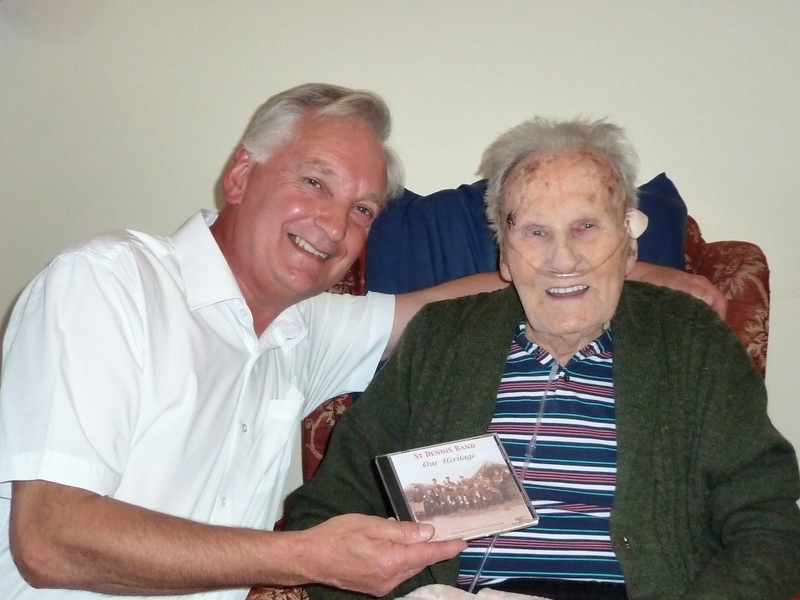 Frank, better known as Harley Brewer during his time at St Dennis, recalls with great affection the musicianship and comradeship he experienced initially under his father’s wing and the renowned Bandmaster, also in the photo, Mr Charley Baker. Younger brothers Terry and Melville followed Frank in the band thus completing a long association of the Brewer name in the playing ranks of the band. Frank spends leisure time listening to Brass Band music and would welcome an early afternoon visit from St Dennis Band supporters who will enjoy his amazing memory of concerts, occasions and fellow players from the late 1920’s onwards. A successful day was had by members of the St Dennis band who attended the Helston solo contest on Saturday 20th October. 13 players took part in solos, duets and quartets. Ellie Joy was placed 2nd in the ‘Under 18’s’ slow melody in a closely fought head to head with Grace Thomas of Bodmin. Whilst in the ‘Open’ slow melody, Ellie was placed 1st out of 9, with Grace in 2nd place. Julie Dobson was awarded 3rd in the over 40’s solo class. In the open duet, Terry Sleeman and Ellie Joy were awarded 2nd. In the senior quartet St Dennis entered 4 quartets, with the quartet of James Hammett, Ellie Joy, Rachael Sloggett and Andrew Hammett coming 1st, winning the ‘Championship of Cornwall’ quartet shield. 2nd: Grace Thomas, Catherine Dowrick, Julie Dobson and Neil Pascoe. 3rd: Neil Pascoe, Terry Sleeman, Rachael Sloggett and Dave Coad. A big thank you to Grace Thomas who agreed to play in a quartet at the last minute due to illness. Well done to everyone who took part. The band are now looking forward to their own St Dennis contest on Saturday 24th November. Please download your entry from the bands website http://stdennisband.co.uk/st-dennis-band-solo-quartet-contest-2018. We are proud to announce the launch of the new St Dennis Band ‘Music Academy’. The new structure and initiative will see expert brass and percussion tuition taught alongside aspects of both music theory and aural to develop all round musicianship. It will be suitable for either complete beginners or for young people who’ve already started learning, providing them with outstanding instrumental tuition in addition to junior and youth ensemble opportunities. All tutors have the expert knowledge and experience needed to deliver the objectives of the organisation as well as the student requirements. Based at our very own band room in the village, the home of the famous ‘St Dennis Band’, the Music Academy will offer opportunities for every young person to learn in a stimulating and supportive environment whilst enabling them to reach their full musical potential. Importantly, it’s here they’ll be able to share these experiences with other young people, whose interests and goals are similar to their own. Our widely experienced instrumental tutors will deliver tuition arranged on either a one-to-one or shared basis where music is always carefully selected to suit the ability of each player whilst working at the right level for their development. There are also opportunities to put players in for ABRSM graded examinations. The academy will meet on a Wednesday evening between 6:15-7:45pm and will be coordinated by the vastly experienced Linda Trethewey, who will work alongside our tutors from the Senior Band. Instruments (if required), music and tuition can be provided for just £2 a week. Anyone wishing to come along for a taster session, start to learn or indeed join the academy can contact Linda on 01726 891036. In addition, the organisation has recently launched a more advanced St Dennis Youth Ensemble. Led by two of the most experienced and successful brass conductors/educators in the county, St Dennis Band Director of Music, Mr Darren R. Hawken and Music Consultant, Mr Derek Greenwood; the ensemble will provide the perfect platform and opportunity for the more advanced young brass and percussion players to develop their playing potential. 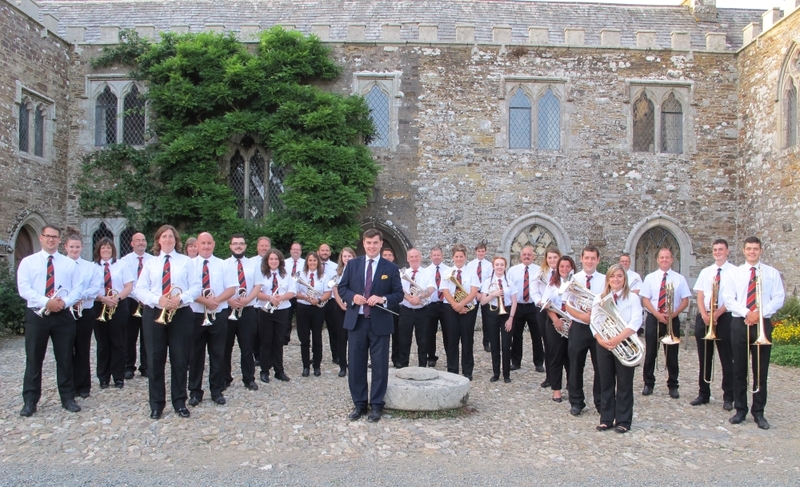 Derek Greenwood brings with him the expertise, knowledge and experience having previously led a Cornish Youth Band to the acclaimed title of ‘National Youth Brass Band Champions’. We welcome young players from all around the county to come and join us and be part of this new, exciting and forward thinking yet progressive ensemble. With public concerts planned for 2019, aspirations to compete on the competition platform as well as side-by-side outreach performance opportunities with the St Dennis Senior Band, the drive and vision is clear – to be a central hub in the county for brass excellence. Weekly membership is merely £2 a week inclusive of instrument hire (if needed). The longer-term ambition is to grow this ensemble to be one of the finest youth brass bands in the county and beyond. If anyone aged 19 or under wishes to express their interest in joining the ensemble, please contact Mr Darren R. Hawken on 07817504036 or drhawken@hotmail.com. The St Dennis Youth Ensemble rehearsals are held in the band room on a Thursday evening between 6:45 – 7:45pm. The 2018 St Dennis Band Solo and Quartet Contest takes place at Whitemoor Methodist Church on 24th November 2018. The band members and committee of St Dennis Band are extremely proud to offer sincere congratulations to Musical Director Darren Hawken who will in September be made a Bard of Gorsedh Kernow in recognition of his services to Cornish Music. Darren will be 1 of 16 new Bards for 2018 and is already looking forward to the Initiation Ceremony which will take place on 1st September 2018 in Newquay. The band are delighted to announce two immediate new signings. We warmly welcome Kevin Ackford on first horn whilst Julie Dobson accepts the position of second horn. Kevin becomes a member of the band following several guest appearances in recent years, most notably being part of our golden year in 2016 winning the West of England First Section title, the Royal Trophy at the West of England Bandsmen’s Festival and the coveted title of National First Section Brass Band Champions. Kevin often recalls that 2016 was one of his lifetime highlights in the 50 years he has been playing. Regarded as one of the finest and most talented horn players to have ever come out of Cornwall, Kevin has held multiple solo positions in bands such as the Cornwall Youth Brass Band and the National Youth Brass Band of Great Britain playing under some fine conductors. His first solo horn appointment was with the Bodmin Band aged just 12 with further distinguished success with the St Austell Band. University then beckoned playing with Rochdale Wilsons Band with notable performances at the British Open before eventually returning to St Austell. His distinguished career has seen him give solo performances both on radio and television in addition to making two appearances at the National Brass Band Championships of Great Britain held at the Royal Albert Hall. As a composer of over 30 works, conductor, teacher and arranger, his knowledge, experience and talent is a vastly welcomed addition to the band. Julie joins the band from the Bodmin Town Band having held the solo horn position and more recently, the flugelhorn seat there for several years. Vastly experienced, Julie held the solo horn position with Greggs Bakery Band (under the legendary Jimmy Shepherd) in the 1990’s, Ripieno Cornet with the Forest of Dean Band when they were promoted to the Championship Section in 1999 before returning to solo horn with the Launceston Town Band and latterly, Storm Brass before joining the Bodmin Town Band. In addition, Julie has made many National Finals appearances over the years. Julie also enjoys playing in ‘JDACC Brass’, a family brass quintet featuring her three talented daughters and husband, David. Julie is a teaching assistant in a rural primary school whilst still finding time to teach brass, recorder and music theory in other local schools. A fine bands person, Julie is a great addition to the band and we wish her every success and happiness in the years to come. Naturally with new signings, we are very sad to say goodbye to two players. Dany Hancock, after 18 years of dedicated and loyal service to both the Youth and Senior Band, takes a break from the band. We will hopefully see Dany return from time to time; however, in the meantime we wish her every happiness and success in all that she does. Departing to Cardiff University is Rebecca Whitford. A product from the youth band, Rebecca goes on to pastures new in September and continues with the next chapter in her educational life. Like Dany, we wish Rebecca good luck in all that she does and we will look forward to seeing her when she visits Cornwall outside of term time.